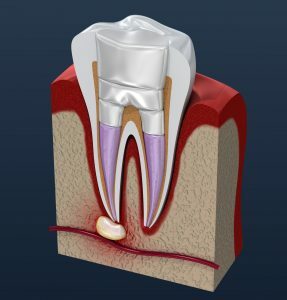 A “root canal” is a term used to describe an area in the center of the tooth which contains a soft area known as the pulp chamber which houses the nerves of a tooth. If this area becomes irritated or infected due to cavities, trauma or decay, root canal therapy is necessary. Despite the traditional stigma of root canal therapy being painful and something one hopes to avoid having done, it can actually be a pain-free, quick and a relatively comfortable procedure. In fact, it relieves your pain and can prevent more complicated oral issues down the road. A root canal is a common dental procedure used to save your natural teeth and prevent the need for dental implants or bridges. Root canal treatments are recommended in the case of an infection of the blood vessels in the center of your tooth caused by trauma, decay, cracks, or chips. Pain in a tooth or gums? Sensitivity to cold or hot liquids or foods? Pain related to an injury or swelling or other trauma? When the soft area that houses the nerves of a tooth, known as the pulp chamber, become infected or irritated because of decay or trauma, your dentist may recommend a root canal. Pittsburgh root canals are straight forward. At Severns Dentistry, we ensure your comfort, keeping the procedure pain-free. We also prevent other oral issues from becoming a problem in the future, which is why it’s important not to wait if you are experiencing any issues. With years of experience helping patients with root canal treatments, we have the proven ability to get you the results you need and quickly. First, we’ll take X-rays or examine recent X-rays on file to determine if in fact you do have decay or an infection. Using local anesthesia, we will perform the root canal, which involves a number of steps. We remove the diseased tooth pulp, clean and disinfect the area, fill the roots that have been opened, and seal. Severns Dentistry uses leading-edge procedures and technology to ensure your comfort and a successful treatment. Our goal is for you to enjoy a lifetime of health in that affected tooth, and keep your natural teeth when at all possible. When your permanent crown is ready following the root canal treatment, we’ll complete the procedure by placing the crown on the top of the tooth. It’s important to practice good dental hygiene following root canal treatments. Pittsburgh-based Severns recommends that you schedule a follow-up visit to X-ray the treated tooth to confirm all signs of infection are remedied. With the proper care and attention, your treated tooth will be healthy forever. Are you experiencing pain in a tooth or gum area? Have you had trauma or injury that has affected your teeth? Don’t wait—call Severns Dentistry today and get the relief you deserve!